Anyone who has ever wished their birthday would go on for ever will love this book. Splodge and his friend Humbug set out to solve one of life's little mysteries: 'Where does Thursday go before Friday comes?' 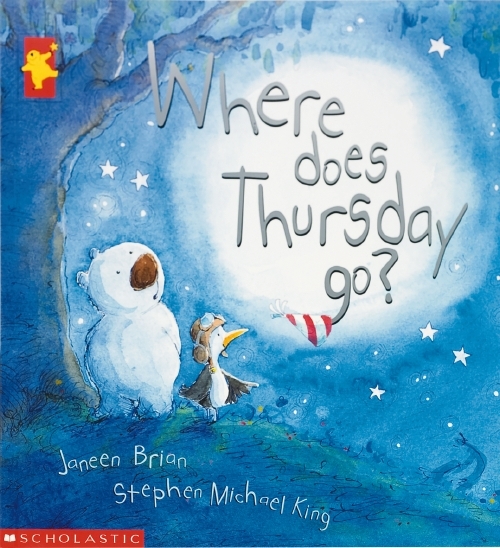 This friendly and highly appealing book is a perfect combination of Janeen Brian's charming story and Stephen Michael King's luminous, whimsical illustrations. I was born in Adelaide, South Australia, looking like a skinned rabbit—according to my dad! When I was four, I went to a small school run by two elderly ladies (I loved them—like grandmothers with beautiful voices), then to Brighton Primary where I found out I was quite good at school. High school was at Brighton High, where I came to love Latin and French and loath Maths and Chemistry. Yes. It’s Neen. I love it because my family and my oldest friends call me that and so it always feels loving and affectionate. Well-behaved, a good all-rounder, bored at times, got high marks in exams; loved recess and lunch times! Turned up at school pretending I was a new girl. I even dressed differently and pretended I had no books, no friends and didn’t know the schoolwork. The teacher let me get away with it! The Enid Blyton books, because there were few others in my life, but nothing came up to those books for adventure. I still recall the ache for those types of childhood adventures! I could NEVER in a million years pin that down to ONE! Sorry. I love seafood (actually I love all food! ); my favourite colour(s) are red and green—and black (if that’s termed a colour! ); and I loved An Angel at my Table—an evocative, poignant film about the New Zealand writer Janet Frame. Me. I just decided to write small bits and pieces for fun, and mainly for my two daughters to start with. Later I was given some encouragement by a creative writing teacher or two. Probably in my early thirties. I’d hardly written at all before then and never, ever set out to become a writer! I hadn’t planned to. But over the years I became hooked! I jot down notes in books; I keep my eyes and ears open for interesting things and imagine how they might lead to a story...or at least an aspect of one. Ideas often spring into my mind as I read other authors' work, and I also try to remember times when I was young. I write notes anywhere, but to actually write my stories or poems, I really prefer to be somewhere quiet and 'bookish'. My office is perfect! I can’t think of anything better than to be able to create—and writing fulfills that desire in bucket loads! Have you had any funny or embarrassing moments as a writer/illustrator? Probably, but I can’t recall them. I read at every opportunity, make mosaics, do aqua-aerobic classes, go to yoga, walk, garden, go to films and theatre, spend time with my family and friends, travel and do craft work. I was a primary teacher and I enjoyed that before becoming a full-time author, so I’d either have liked to work in kindergartens or gone into some area of art. The Italian physician and educator, Maria Montessori.